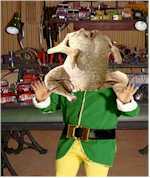 Thanksgiving and Football at the North Pole – A Silly Clumsy Story! Thanksgiving and Football at the North Pole can be very silly! Thanksgiving and Football at the North Pole! Today is Thanksgiving Day in the United States! Happy Thanksgiving! We have Thanksgiving at the North Pole too. That is when all the Christmas elves come home. We talk about all the things we are thankful for. Then we have a big dinner. After that, we all go outside and have fun! But, many, many years ago, things went a little, well, funny. Keep reading to learn more about this funny story about Thanksgiving and Football! Ho! Ho! Ho! and Merry Christmas Day 2012!! I hope you had fun Christmas Day 2012 morning too!